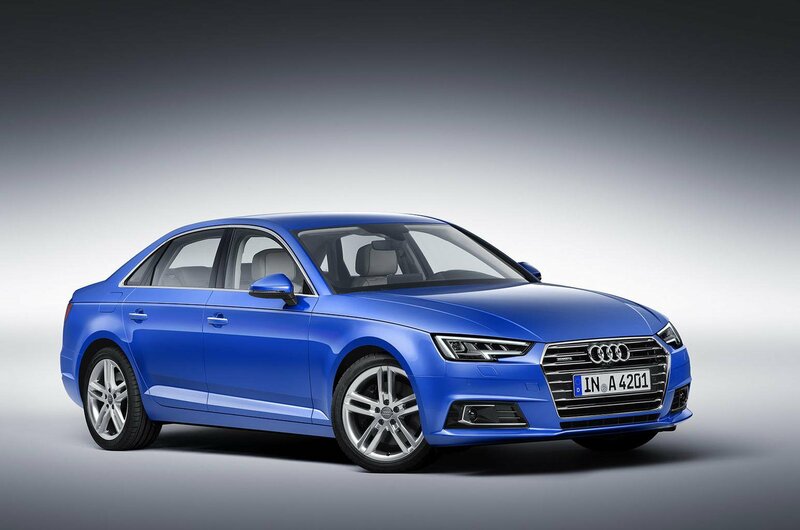 2015 Audi A4 revealed - pricing, pictures and engine details | What Car? The fifth-generation Audi A4 has been unveiled, with new looks inside and out, a heavily revised engine line-up and newly developed chassis. It will make its public premiere in saloon and estate form at the Frankfurt motor show in September before the saloon goes on sale in November. The new A4 doesn’t look drastically different - it is intended to look more formal than its main rivals, the BMW 3 Series and Mercedes-Benz C-Class. Although appearing a lot like a facelifted version of its predecessor, every body panel is described as new. Greater attention to aerodynamics, including the adoption of a largely flat undertray and detailed sculpturing around the rear end, means the Audi is the most aerodynamic of its rivals. The new A4 has grown, but only slightly - it is 25mm longer, 16mm wider and the same height as its predecessor in saloon guise. This makes it 41mm longer, 32mm wider and 13mm lower than the latest Mercedes-Benz C-Class. Despite its growth, Audi claims the A4’s weight has been reduced by up to 120kg through the adoption of hot-formed high-strength steel within the body structure and aluminium for various body panels, including the roof. Inside the new A4 gets a new design with more space than ever before. Audi claims an additional 24mm of head room in combination with 11mm more shoulder room up front. The longer wheelbase has also provided the basis for a 23mm increase in rear seat legroom. Audi also says that the A4's newly designed seats weigh 9kg less than those of the old model. The new A4 will be launched with a choice of three turbocharged four-cylinder petrol, two four-cylinder diesel and two V6 diesel engines, which Audi claims to be 25% more powerful and up to 21% more economical than the old ones. The most popular is set to be Audi’s familiar 2.0-litre four-cylinder diesel. It now complies with EU6 emission regulations, and comes in two states of tune, with either 148bhp or 187bhp. There will also be a A4 2.0 TDI Ultra model with exterior styling tweaks, revised gearbox ratios, lowered suspension and low-rolling-resistance tyres to boost economy. In 148bhp guise it is claimed to return 76.4mpg and 95g/km in saloon form. The 3.0-litre V6 diesel also comes in two states of tune, developing either 218bhp or 272bhp. Provisional figures suggest the former will return 67.3mpg for average CO2 emissions of 110g/km. The petrol range includes a new 1.4-litre four-cylinder unit that delivers 148bhp. This is sufficient for 0-62mph acceleration of 8.9sec and a 131mph top speed together with combined consumption of 57.7mpg and CO2 emissions of 114g/km in combination with the optional S tronic dual-clutch automatic gearbox. Further up the range is a reworked version of Audi’s 2.0-litre four-cylinder petrol engine. Options including a 12.3in digital instrument panel, an 8.3in monitor, inductive charging pad for mobile phones, sensor control opening of the luggage compartment, a Bang & Olufsen sound system, tablet-based rear seat entertainment and the latest version of Audi’s Multi Media Interface (MMI) system that features an LTE internet connection. In models from the 190bhp 2.0-litre four-cylinder diesel upwards, the new A4 comes with Audi’s Drive Select system as standard, allowing the driver to alter the characteristics of the throttle, steering and gearbox. Front-wheel drive is standard on all models except for the A4 3.0 TDI, which gets a four-wheel drive system. Four-wheel drive is also optional on the higher powered 2.0-litre petrol and the 187bhp A4 2.0 TDI. All four-cylinder engines get a new, lighter six-speed manual gearbox. A revised version of the existing seven-speed dual-clutch S tronic automatic is available for the first time on front-wheel drive A4 models and comes as standard on the least powerful of the two 3.0-litre V6 diesels. The more powerful 3.0-litre V6 diesel engine gets a standard eight-speed automatic ‘box. Prices for the 2015 Audi A4 start at £25,900 for the 1.4-litre saloon with a six-speed manual transmission and in SE specification. Avant versions of that model will go on sale in April of next year, and cost from £27,300. The cheapest Avant model at launch will be the 2.0-litre TDI Ultra, which is priced from £30,550. The range-topping 3.0 V6 TDI Quattro costs £40,350. Chief rivals for the A4 will be the Mercedes-Benz C-Class and the BMW 3 Series, although the Jaguar XE will also be hoping to steal sales from it. All of these cars currently hold a four-star rating from What Car?.